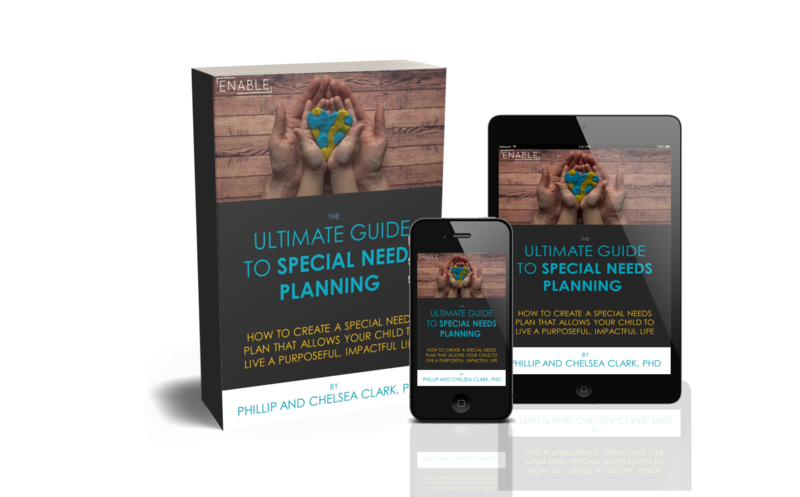 Creating a Special Needs Plan can feel daunting due to the complexity of the planning process and the numerous strategies necessary to plan effectively. It might feel like you have an endless list of recommendations to review and resources to acquire as you begin planning for your child’s future. Given my personal experience having a younger sister with Down syndrome and my 10+ years of professional experience guiding families through a comprehensive special needs planning process, I believe that the most important things to consider when you begin planning for your child with special needs may be different than you think…. The MOST important aspect of the special needs planning process is your mindset – both before you begin planning and throughout the entire planning process. When my sister, Sarah, was born her doctors gave my parents a long list of limitations for her future abilities. My parents heard things like: she may never be able to ride a bicycle, be successful in school, or live independently. They were also told that Sarah would probably never be able to read. Today, 28 years later, Sarah works in a second-grade classroom where one of her many duties is tutoring the students on READING… the exact skill professionals told my parents she would never be able to perform herself! If my parents had accepted the limitations that others conferred on Sarah and failed to push her to develop the abilities they saw in her, who knows where she would be now or what she might not have accomplished. What limitations have doctors or other professionals suggested about your child’s abilities? How have those limitations influenced your mindset? Do you tend to focus on your child’s disabilities and feel discouraged? Having an abundant, abilities-focused mindset about the amazing future that your child can have will (among many other positive things) allow you to think beyond what others may have told you was possible for your child. Your mindset is what lets you look to the future and see unlimited potential in your child, the power to overcome every obstacle in their path, and the ability to live a purposeful, impactful life—the life you’ve always dreamed of for them. The second important aspect of the special needs planning process that you may not have considered is developing a strategy to overcome any negative emotions you feel as you begin planning for the future. Overwhelmed – with the amount of decisions that they know they need to make to effectively plan for their child’s future. Frustrated – with the overabundance of information that exists that often has conflicting ideas, recommendations, and approaches. Confused – about where to begin this ‘huge’ endeavor of planning for their family’s unique goals, dreams, and challenges. These emotions often coexist in a viscous cycle that paralyze the individuals trying to plan and prevent them from making any decisions. This often results in families failing to create any plan at all. You may be experiencing these same emotions right now. Because of the complexities of special needs planning, these emotions are natural. So how do you overcome these paralyzing emotions? How do you get out of the viscous cycle that often stalls planning? Just as I encourage my clients, I want to encourage you to think differently about the planning process. What would happen if you changed your thinking and began focusing on your child’s abilities, hopes and dreams, instead of their disabilities and limitations? I’ve witnessed firsthand, in my own family and in the families that I serve, that the entire special needs planning process changes dramatically when family members shift their mindset in this way. Now, don’t get me wrong, shifting to an ABILITY focused mindset where you think ABUNDANTLY about your child’s potential, isn’t a magic formula that will suddenly eliminate all the overwhelming, frustrating, and confusing feelings that you may experience. What it will do, however, is give you the motivation you need to continue pushing forward with your planning process when the number of decisions you must make feels overwhelming, the conflicting information you discover leaves you frustrated, and the uniqueness of your situation causes confusion. Your ability-focused mindset will propel you toward the finish line, despite these challenges. Finally, the third important thing to do as you begin planning is to make sure you surround yourself with a team of doctors, therapists, advisors, and other professionals who all share your abundant, ability-focused mindset regarding the future of your child. Your team will encourage you to persevere with your special needs planning process no matter what happens because they also believe that your child can live a purposeful life of impact. It is also vital that the professionals you choose to work with understand the complexities of special needs planning. Any financial and legal decisions you make and strategies you implement must work together to accommodate your family’s unique situation and special needs plan. Although financial advisors and attorneys who do not specialize in special needs planning may truly desire to serve you well, they are likely not aware of the many intricate details involved in the special needs planning process and may not be able to fully comprehend the uniqueness of your family’s needs and situation. Do you specialize in the special needs financial/legal planning process? How long have you been helping families plan for their child with special needs? Why do you work with families who have children with special needs? The answers you get to these questions should help you evaluate whether the professional is a good fit for your family. These three things will set you up to create a plan that allows your child to live a purposeful and impactful life.